GPTip42day - How do I add a Fixed Asset but not depreciate it? 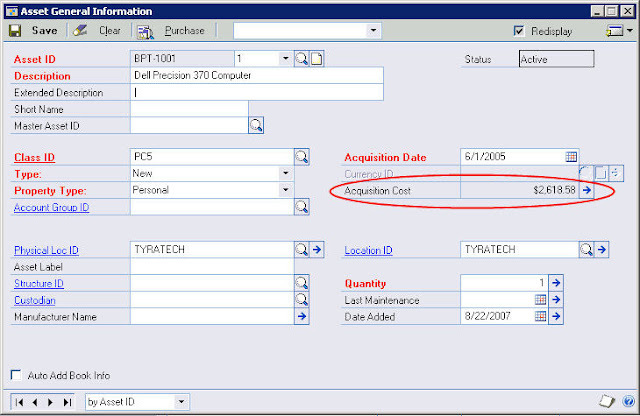 Let's say someone added an asset and transposed some of the numbers in the Acquisition Cost field. Is there a simple way to correct it? Of course! A question I run into rather regularly from users is 'Where do I enter the MACRS tables?'. Well, the short answer is, you don't. GP doesn't utilize MACRS tables for calculating MACRS depreciation. Instead, it uses a combination of the many different depreciation methods and averaging conventions available in GP to simulate MACRS. Fixed sporting events are bad. Fixed transmissions are good. Fixed Assets are ...well... in between. As I work on year end tax returns for the company, one of the things we look at every year is our tax vs. book depreciation. One thing we find every year is that there are a few assets where the cost is different between tax and book. In our case, they should always be the same. It's getting better each year but we've still got a small handful this year. Fixed Asset Integration error: "String was not recognized as a valid DateTime"
DOC 1 ERROR: System.FormatException: String was not recognized as a valid DateTime. Consider this scenario. You are implementing Dynamics GP Fixed Assets in your company. None of the Fixed Assets have been imported yet. You have ensured you did all your setups just perfect. Now, It’s turn to import your assets into Asset General window using Integration Manager. It can be handled using Integration Manager eConnect destination adapter for Fixed Assets. GPTip42day - Should I be using Daily or Periodic Depreciation Period in Fixed Assets Book Setup? 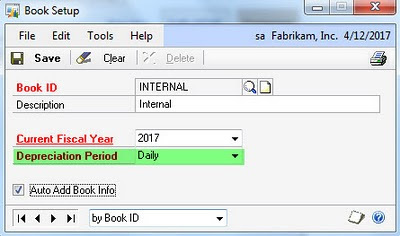 The answer depends on if you want depreciation calculated based on the number of days in each period or equally for each period of the year. I'm sure this has never happened to anyone, but if by chance you ever inadvertently close the Current FA Fiscal Year, it will prevent you from posting depreciation into any period in the current fiscal year. How do you get around that? It's pretty easy.